The Montana House was originally built in 1959 in Apgar Village as a Regional Craft Shop. We feature arts and crafts made by Native American and Montana artists and authors. These include pottery, wood pieces, jewelry, photography, books, quilting, painting, glassworks and Native American artwork, soaps, lotions and beadwork. The shop offers a wide music selection including traditional and contemporary Native American musicians and local and western artists. It is also one-stop shopping for Huckleberry, Mooseberry, Wild Chokecherry and other local Montana grown berries in jams, jellies, chocolates, pancake and muffin mixes, coffees and teas. Jackie Larson Bread: Currently traditional Plains ledger art with its vibrant color & stylized depictions is the basis for her bead work, as well as delicate Blackfeet florals, bold Blackfeet geometric designs, and illusionary pictorials. Images are hand drawn and composed into intricately beaded bags, boxes, parasols, other traditional utilitarian items. Rich Charlson: Close inspection of Rich’s work reveals a complex combination of colors & textures, almost kaleidoscopic in effect. The designs in his bowls are created by combining numerous pieces of woods of different colors. Some bowls have over 5,000 pieces of wood in them, with none of the wood being dyed or painted. Elaine Snyder: For millennia, human beings have been using animal hides to clothe and protect themselves. Elaine works in this traditional medium, bringing to it the dynamic of modern attire. 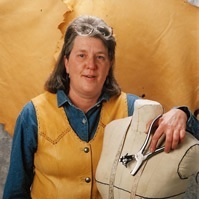 She takes great ]pride in turning tanned hides into items that are both beautiful and usable in daily life. 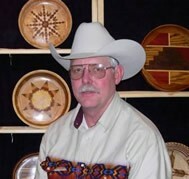 James Jensen: Humans have used woodcarving for centuries in order to express themselves activities. 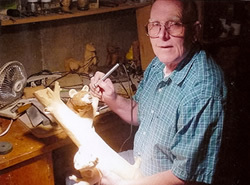 Through his works in wood, Jim has become known as “The Bear Man” because most of his carvings are of bears that he has observed while hiking Glacier National Park and working in the mountains. For more information on these artists and other Montana Circle of American Masters, see their website at http://www.art.mt.gov/. 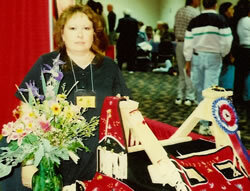 Bill Kramer Antler cribbage boards, jewelry, beads, whistles, etc.